I mailed these out on Monday to this month’s bee, Kim. 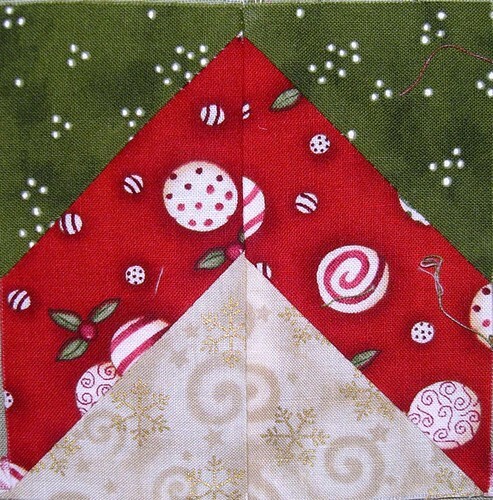 She sent us Christmas fabric and asked for “traditional” blocks. 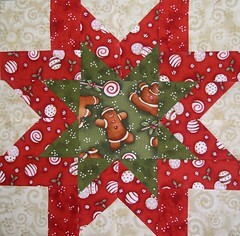 I looked around online and settled on these two patterns, Morning Star and Poinsettia. I think I have finally gotten over my mental block about this virtual quilting bee – I think you are able to see the vast improvement I’ve made over August and September’s blocks. The seams and points all line up (almost) :). But where they don’t it is not that obvious. I like how I arranged the fabrics, and for the first time in this bee, I was happy to send these out. Hopefully I will be able to keep it up. Next month’s fabric is going to be sent soon, and she wants string piecing, something else I have not tried yet. I want to get it done as quickly as possible, so I can send it back before I move. I am moving! I finally found a new apartment that has almost everything I wanted, and its only about 1/4 mile from where I am living now! I finally got lucky, I had almost given up because I had been looking since May. It is a duplex in a neat little neighborhood called Cottage Home, and has a really cool loft area that I am going to make my sewing room. I can’t wait to move in and get settled. Moving Day is only a few weeks away. I’m moving on Friday the 13th! 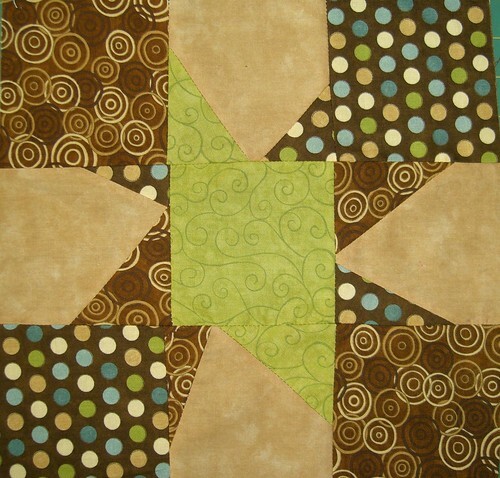 After next month’s quilt block, I only have one more project I need to get done before the move. It’s the Poky Puppy quilt my mom wanted me to make for her. I will have to post about that later. I just wanted to share this. Its one piece of a block I am doing for this month’s bee. The points match! I’m glad I am getting better at this. Lets see if this block will be the one where all the seams line up for once. 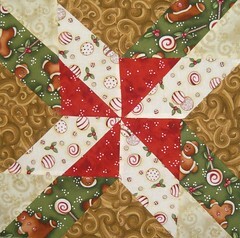 I also managed to get my block done for my virtual quilting bee. This month’s bee wanted stars, any way we wanted to do them, as long as they were stars. I decided to do a maverick star, because after the disaster of trying to do triangles in last months block (which I still feel horrible about), I thought this would be the best way for me to do something that would turn out halfway decent. As you can see I still messed up matching a seam in the upper left hand corner. But it is still definitely better than my last one, so I will give myself credit for that. It’s just so hard when everyone else can do these beautiful and complex blocks, and I’m struggling in the proverbial kiddie pool. I had been watching the bees before I decided to join ones, and the blocks I saw in the pools made me feel like it was something I could do to improve my skills but within a group of people who were entry level to intermediate ability. Somehow I ended up in a group of super-quilters. I feel so bad, because even if this block is an improvement for me, and looks pretty ok, I go to add it in the pool and look at what everyone else has done…I hate being the weakest link. Maybe next time around, I’ll find a group that makes me feel less inadequate.